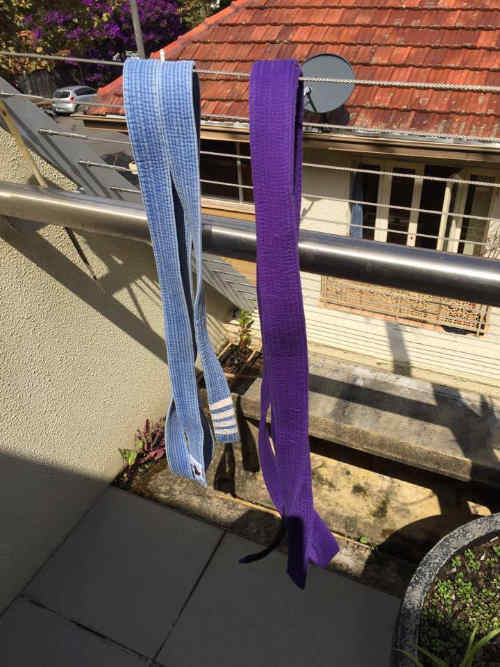 After nearly six years on this journey, I recently celebrated my graduation from blue belt in BJJ to purple . I wrote a similar post a few years back, entitled 49 Things I Learned as a White Belt in Brazilian Jiu-Jitsu. I believe it helped a few people in their journeys as this was one of the most popular in my blog’s history. I hope to do the same with this post. Here are the things I learned as a blue belt in BJJ. I am learning how to breathe. This is one thing I have noticed among the great ones in BJJ. At a JJ Machado seminar, I watched him roll with countless guys one after the other, and was absolutely amazed at his stamina. I started to hear his breath, and it was amazingly deep and slow. I then realised how he did it. You hear Rickson Gracie breathe the same way when he trains, and when I trained with Saulo Ribeiro, the same breathing pattern was unmistakeable. I have taken yoga about as long as I have taken BJJ and they get the same result and relief from very uncomfortable positions using the focus on breath. As a wrestler in high school, I used to gas out. I always chalked it up to a lack of stamina. But in a rolling session as a white belt, a black belt told me “Matt, you are not breathing, you are holding your breath”. It really hit me like a ton of bricks, and from then on, my game changed for the better. I am finally learning how to breathe when rolling, and it’s paying big dividends. I am not getting gassed out like I used to. The video below, illustrates Rickson Gracie’s use of yoga and breathing, and are a big reason why he became a legend in BJJ. I am learning how to relax. Being an ex-wrestler I always thought the game was about strength, and work rate, but this is counterintuitive in BJJ. I learned “flow rolling” from Andrew Nerlich, a black belt with whom I train. The benefit of this style is that instead of getting locked up in one or two positions throughout the roll, you can see literally dozens of situations, in which you can try your escapes, defences, or attacks. Since your opponent is not resisting 100 percent, this combines the best elements of drilling and rolling. And it is fun! To an outsider or white belt, it really shows the skill and mastery of the techniques. As I am learning to relax, I am starting to look for mistakes my opponent’s make. The inexperienced will make them. The experienced will look for my mistakes. I am starting to chain attacks and defences. I have found a few submissions that suit my game. But this can hinder your progress if you rely only on those, and you will become predictable. I have found that having a few backup submissions that feed off my favourites can pay big dividends. Whenever I find a new submission that works well for me, I constantly look for related submissions. The same can be true of escapes, depending on your opponents’s reactions. The higher belts have mastered this, and it is why they always seem “one step ahead” of you. This is not magic, it is the fact that they have been in this position and dealt with it dozens of times more than you have. I am learning the importance of pressure. This is how a 150-pounder feels like a 200-pounder when they are on top of you in side control. By keeping nothing other than your feet on the ground, you are learning how to make your opponent tired by carrying your weight. It also makes you realise how important all those hip escapes are that we endlessly drill. You need to create space, when on the bottom. Defences and escapes are key. As the great Saulo Ribeiro said, white is the belt of survival. Blue is the belt of escapes and defences against the worst positions and submissions, and I have focused a lot on this. You can never comfortably attack if you have no confidence in your ability to defend, as you will never take a chance of losing position. Embrace the bad positions and see it as a challenge to work your escapes and defences. You are learning to threaten your opponents to get them to back off on gaining a superior position or trying to submit you. Many times all you need is one hand attacking the collar and they know they cannot let you get the other hand in. For example, as they are trying to pass your guard, threaten the cross collar choke or baseball bat choke. I am losing the fear of rolling with the beasts. I am learning how valuable it is to roll with a variety of people, and especially the importance of rolling with really good grapplers. There are always some guys who you cannot really threaten, and they will go light and “coach” you as you go along. Seek these guys out as often as possible for rolling. They will be flattered when you start using moves they showed you when you roll. I am learning the value of mastering a few moves at a time. When I find something that suits my game, I recognise it immediately. I begin drilling it heavily and this is way better than knowing a lot of techniques without any real understanding of them. I look for the opponents reactions to these moves once I master them, then adapt them further. I am learning how to be comfortable in most positions. Although I see the wisdom in keeping it simple, I have learned that you need at least two or three “go to” techniques from each position. This is so you will never really end up in “unchartered territory”. There is nothing more frustrating than having no answer to an attack without any idea of a response. I make it my business to find at least a few good moves in any possible position. This is also how you stay one step ahead. You must specialise in something. For me, it was sweeps. I saw the value of being able to quickly reverse the positions without the effort of passing a guard. Sweeps are also extremely valuable to get a heavier person off of you. I made it my business to learn every sweep I could, but master about 5 or 6 really well. I am learning to use my feet like hands. It is said that you must learn this as a purple belt. It is never too early to begin. I can really see the wisdom in this as you need all weapons at your disposal, and especially since your legs are stronger by far than your arms. But it is easier said than done. How can you force yourself to do this? For me, it was simple. I focused on the positions, like bottom half guard and butterfly guard that rely on using your hooks. This has started finding its way into other areas of my game, which has created a positive result. You must be proactive in every position. For instance, in half guard bottom—don’t get flattened, stay on side, prevent cross face, prevent under hook. Start attacking from this position. Sweep, take back, or submit. I start working it as soon as my opponent has transitioned into the position and before they have had a chance to “relax” in it. Your instructor does not expect you to be his or her protege. What works for them could be completely different than what works for you, depending on body style and attributes. You are starting to develop a game of your own. Your body style, athleticism, coaching, and background all play a role in this. Don’t fight it and don’t copycat others. Your game is unique. But all things being equal, I prefer to learn from a smaller instructor, as they have to be more technical. Find a way to train solo. For me, a grappling dummy was the best investment I ever made in my game. In a matter of months my half guard bottom, sweeps, and submissions from all positions improved dramatically. If I was injured, I just used the other side of the body and learned to become ambidextrous more quickly. The ego is finally being conquered. By the time you have reached high level blue, you have literally tapped dozens BUT have been submitted by hundreds. You have learned to not make a big deal out of it when you tap someone, but have embraced getting tapped, as it is the quickest way to progress. I make it a point to ask the higher belts how they got that submission on me. Only the most selfish refuse to tell me. As well, I have learned many things from white belts, as I am open to everyone’s wisdom. At this level, you will start tapping white belts, even if they are very strong, and some lower level blue belts pretty regularly, if you relax, and let them either gas out or make mistakes. They will usually do one or the other. I am learning the power of yoga. As I mentioned above, I have been doing yoga as long as BJJ. It has kept me relatively injury free for two important reasons. My range of motion is better and I am learning to be comfortable in bad positions. Without it, you are more likely to get submitted and more likely to get hurt. It helps balance, strength, and especially breathing. I am learning that you must take responsibility for your own success. BJJ guys and girls really are the coolest in the world. They love helping other BJJ people out with anything and this art attracts the best people. But you must take responsibility for your progression. No one is going to take you aside and say “I am going to make you a better grappler” or “I am going to find your weaknesses and strengthen them”. This is especially true with regards to your diet and lifestyle. You must take responsibility for it. I am learning to love giving it back. My instructors and higher ranks have given so much to me. I now feel an obligation to help the newer students, just as there were so many who helped me. I love the opportunity to teach, and it really helps me learn the game so much better by teaching its principles. I preface all the above with “I am learning”, because even as a purple belt, I am still learning these principles, and will never master them fully. That is what I love about this art. What did you learn as a blue belt in BJJ?